The regional winners of the YouTube Space Lab contest were announced this week. High school students were challenged to design an experiment that could be performed by NASA aboard the International Space Station. The two global winners will get to watch their proposed experiments live-streamed by YouTube from space. Pretty sweet. Two of the regional winners proposed biology experiments: one that might have implications for disease fighting (at least for plants) and another that looks at spider hunting behavior in microgravity. Could alien superbugs cure disease on Earth? This project was submitted by Dorothy Chen & Sara Ma, high school students from Troy, Michigan (USA) in the 14-16 year old division. They propose to send the bacterium Bacillus subtilis into space to see if it becomes more virulent. B. subtilis normally lives in the soil, and some strains have anti-fungal properties that can be used to treat plant diseases in food crops. 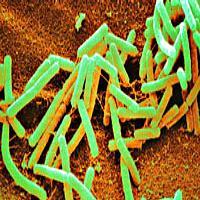 Other strains of B. subtilis can act as "probiotics" when ingested by healthy individuals. In either case, increased virulence would hopefully be a good thing, since that could mean it's a better fungicide or has improved probiotic properties. Chen and Ma were inspired by experiments performed aboard the space shuttle that showed Salmonella bacteria become more virulent when grown in space (which is definitely a bad thing). It appears that the reason why Salmonella become more infectious is that their environment in microgravity mimic conditions in the intestine altering gene expression. It looks like it's an open question whether B. subtilis - which does not normally infect the gut - will be affected by microgravity the same way. Wilson JW et al. "Space flight alters bacterial gene expression and virulence and reveals a role for global regulator Hfq." Proc Natl Acad Sci U S A. 2007 Oct 9;104(41):16299-304. Epub 2007 Sep 27. Can you teach an old spider new tricks? This project was proposed by Amr Mohamed of Egypt in the 17-18 year old division. 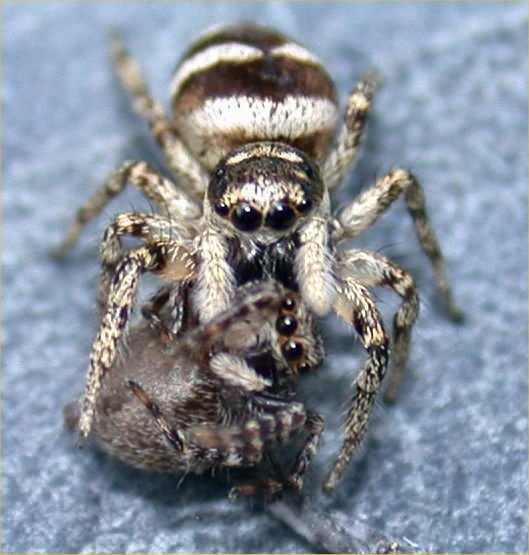 He proposes to test whether microgravity affects the behavior of the zebra spider Salticus scenicus. The zebra spider is a type of jumping spider which does not build a web. They instead stalk their prey, pouncing on it to capture tasty insects. They glue a silk thread to the surface they are jumping from as a "lifeline". That way if they miss, they can climb back up to their perch. It sounds like a creature out of a horror movie! So the question is will this "tiger among spiders" be able to adjust it's hunting technique in microgravity and still catch its prey? Amr doesn't think so. Which experiment am I rooting for? My head likes Sara and Dorothy's bacterial experiment for it's potential implications for human (and plant) health. But my heart likes Amr's jumping spiders, because spiders hunting in space sounds pretty cool to watch. Fortunately I don't have to choose, since the two entries are in different age categories. Both could win! Good luck! March 22nd Update: Sara Ma and Dorothy Chen are the YouTube SpaceLab contest global winners! Bacteria in space FTW!